CLBenchmark is a new OpenCL 1.1 benchmark for Windows (I don’t know if other OSes like Linux or MacOSX are or will be supported). CLBenchmark includes 17 different OpenCL tests. You can run them all or individually. 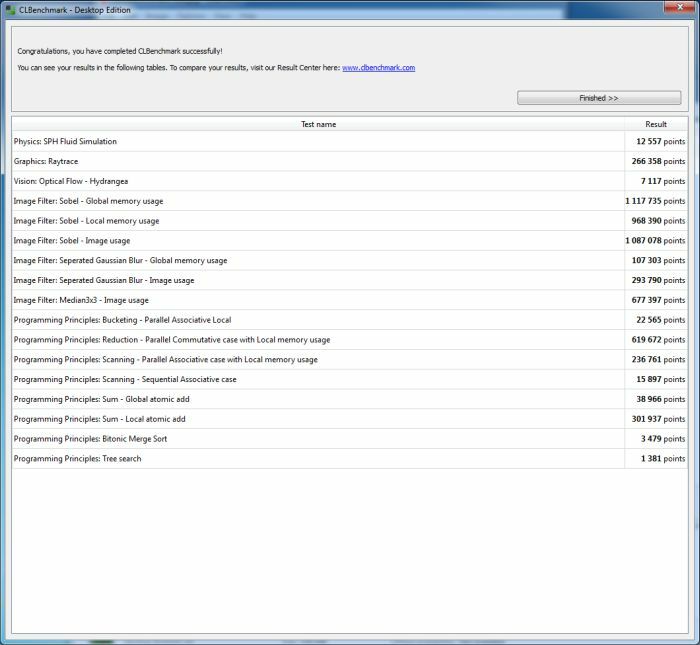 CLBenchmark 1.1 Desktop Edition is an easy-to-use tool for comparing the computational performance of different platforms. It offers an unbiased way of testing and comparing the performance of implementations of OpenCL 1.1, a royalty-free standard for heterogenous parallel programming. CLBenchmark compares the strengths and weaknesses of different hardware architectures such as CPUs, GPUs and APUs. 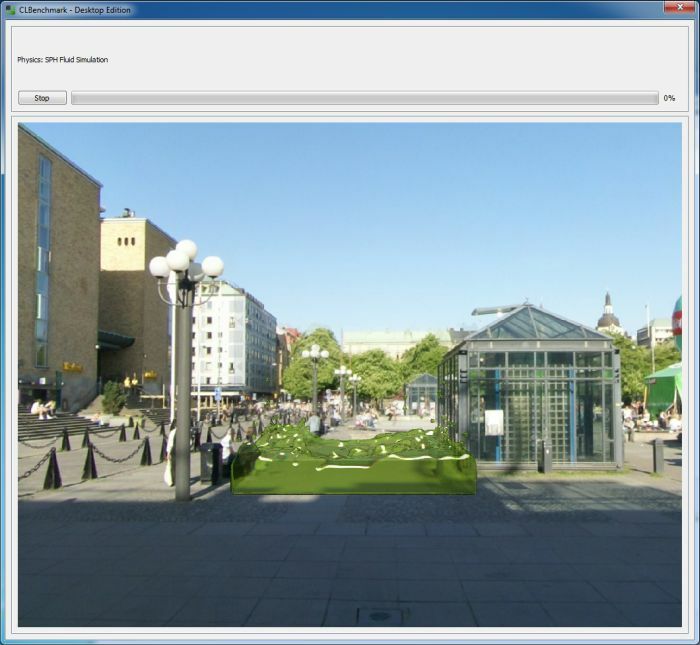 The test results are listed in a transparent and public OpenCL performance database. 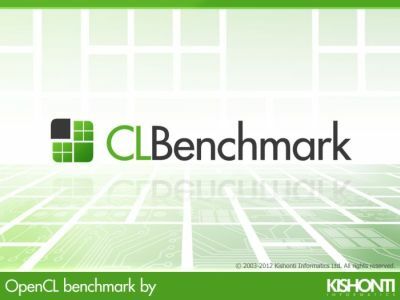 CLBenchmark 1.1 Desktop Edition supports any standard-compliant OpenCL 1.1 implementation and it is compatible with every major vendor’s solution. You can download CLBenchmark from this link. CLBenchmark homepage can be found HERE. If you have GeForce then do NOT test because OpenCL 1.1 performance is ABNORMAL until this issue will be fixed (1.1 fixed or new 1.2). CLBenchmark is meant to measure the performance of the OpenCL implementation as a whole – which consists of a hardware and a software part too. You are free and more so welcome to test any device/driver you have! Anyway, NVIDIA has official OpenCL 1.1 support, there is no reason to not test with them – difference between the performance of driver versions are natural to have, and the results are handled according to this fact. @fellix: please, where do I download your program? AMD needs to maintain strong OCL support, simply because there’s no other widespread API that can expose their hardware to the masses. Also, OCL is quite native to AMD’s heterogeneous compute approach — they have both competitive CPU and GPU portfolio. Nvidia is just making its entrance in to that territory, and they have to compete with the much less powerful ARM architecture for their integrated solutions. On the other hand, Nvidia is trying to push CUDA out of its homogenious cage slowly in to x86 compatability, and opening the compiler via LLVM for third-party implementations. The 680 is terrible for compute. This is on purpose as NVIDIA want people to use GF110 for compute. As expected realy. Nvidia was worse than AMD in OpenCL with previous graphics cards as well. Now it gets even worse not to care. Adobe already rewrote some things from Cuda to OpenCL, funny thing is that they did it(or atleast announced) after 680 aired. Maya(which is owned by Autodesk of all companies !) implemented AMD’s physics engine(you know OPEN and CROSSPLATFORM). NVidia’s TDP and size of the crystal is too big for something that has features like 7870, add something they cut off and it would be another 4xx series all over again. And even gaming features aren’t much better then 7870 at 1920×1080. Noone cares for maximum > 80 fps at this resolution when it has downsides at around 30 – that causes more disturbance to an eye than 50 to 40. I don’t own 680 series and don’t know anyone who is, friend of mine had 480 and in most games he actually had tearing. Even though i had weaker radeon card i didn’t, everything was smooth. That was 2nd time i got radeon just because i urgently needed video card to replace broked 8800. Hoped Kepler to show something but after i saw tests in depth, i am dissapointed. Guess my new card will be from AMD. But Octane, Arion Renderer is still faster then Lux Renderer or Cycles even on amd. Well, as much as the AMD’s OCL run-time sits on top of CAL/IL, a.k.a. APP. Crash with a FireGL V8800 and with two gtx590 on windows 7 64bit.